Buckle up. 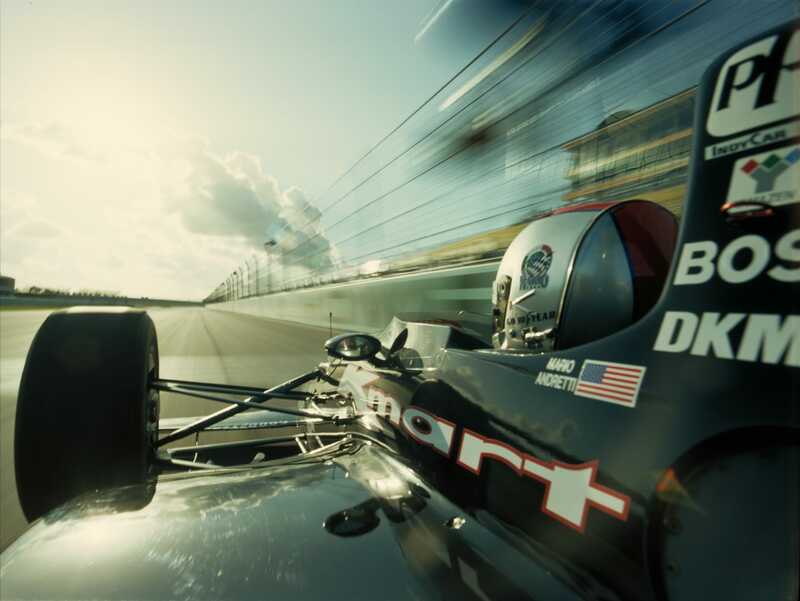 Super Speedway delves into the death-defying drama of Indy car racing and weaves together the stories of some of the masters of the high-speed track. 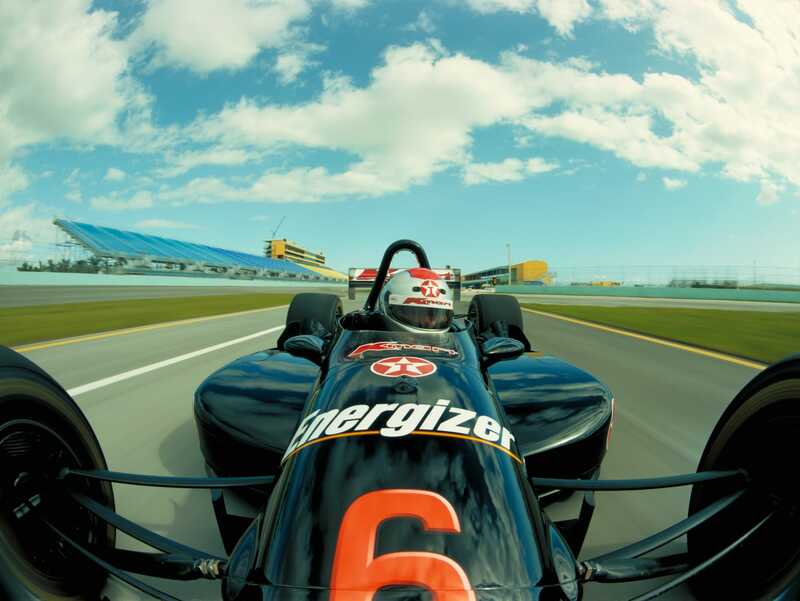 Super Speedway puts audiences in the cockpit of an Indy car and catapults them into world championship auto racing action at mind-bending speeds in excess of 230 miles per hour. 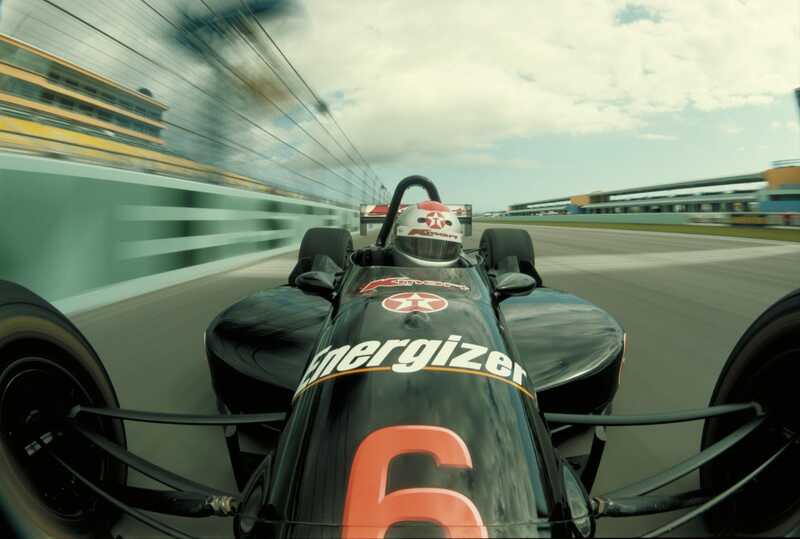 At the core of the film’s action is Michael Andretti, taking on the challenge of testing a newly fabricated car and, ultimately driving it in hot pursuit of the championship in the PPG CART World Series. Michael’s struggle is seen in part through the eyes of his father, Mario, who participates in testing the new car and reflects on his own racing experiences and on the art, science and risk of high-speed competition. 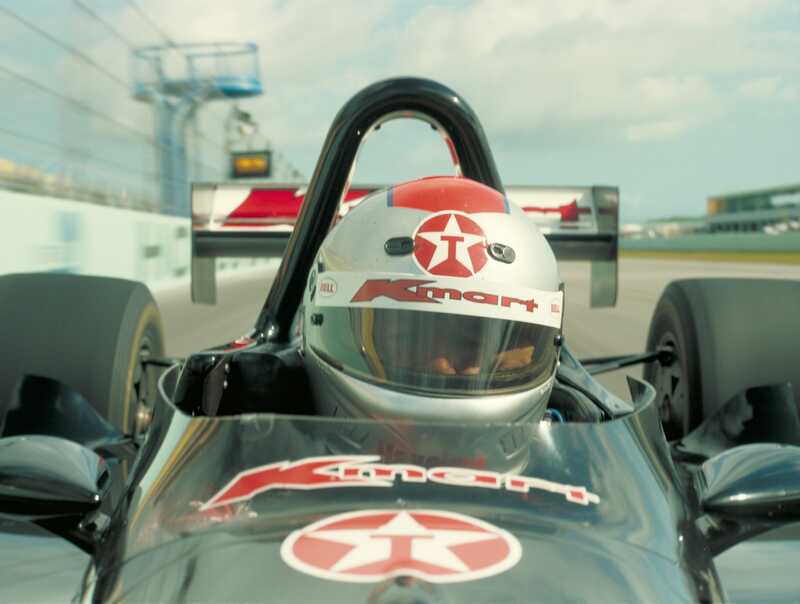 As a driving legend and as Michael Andretti’s father, Mario provides audiences with insight into the driver’s psyche, the balancing of risk and opportunity, and the unique relationship that exists between two generations of champions. Set against the drama of the track are two story lines that follow the remarkable craft of creating Indy cars: the restoration of a 1964 roadster — a thoroughbred once driven at Indianapolis — and the building of Michael Andretti’s state-of-the-art Indy car at the Lola car plant in England. In Lola’s shops the powerful new racing machine for Newman/Haas takes shape: its form is milled and molded, and in time-lapse, the final creation is magically assembled on the plant floor by a team of technicians and engineers. Will the new car perform? Will it be fast and forgiving? Testing the car on some of the fastest tracks in the world, Michael Andretti and the Newman/Haas team prepare for the upcoming season, striving to create the winning synergy between car and driver that will help them take the championship. Mario Andretti lends his expertise, taking the car out himself to probe its behaviour and cornering limits. As Michael Andretti’s Indy car is being readied for the racing season, car restorer Don Lyons is hard at work in his workshop, deep in the Michigan countryside. Lyons’ discovery of a vintage 1964 roadster in a farmer’s dilapidated chicken coop has lead him into an extraordinary restoration project that will take two solid years to complete. Only as the film unfolds and Lyons’ lovingly restored machine approaches completion does the illustrious identity of the roadster become known. 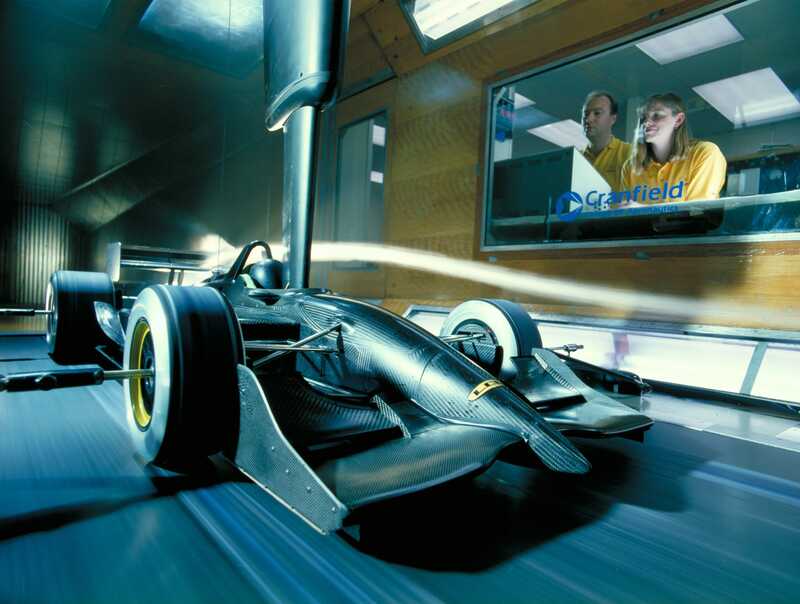 Struggling toward the PPG CART World Series, the Newman/Haas team turns to wind- tunnel testing with a model to fine-tune the aerodynamic forces at work on Michael Andretti’s car. 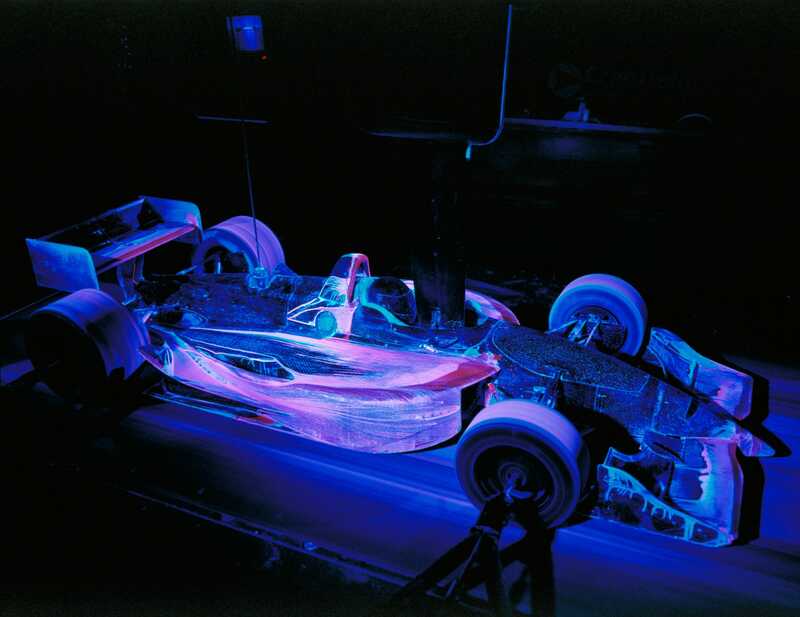 Smoke and ultraviolet dye stream across the car, highlighting the moving envelope of air around the machine and helping the engineers pinpoint adjustments that need to be made. At race speeds, a delicate balance of aerodynamic forces helps keep the car’s tires in contact with the track and gives the driver crucial control in turns. Testing a new car is an unpredictable, high-risk venture: “You just don’t have the sense of what this animal is going to do,” comments Mario Andretti in the film, “these things can bite.” As Michael Andretti and Mario Andretti scream around the track, pushing the limits of the untried machine, audiences will experience viscerally the driver’s true art and courage. Super Speedway culminates in a spectacular portrayal of the racing season: never-before possible giant screen footage captures the drivers, machines and teams of the PPG CART World Series battling each other for supremacy. Watching from the pits, as his son’s struggle for victory unfolds, Mario considers the great challenges, joys and perils of the sport; he remembers the drivers and friends he has lost on the track — racers whose luck ran out. On the screen, classic archival footage depicts some of the sport’s most dramatic crashes — calamities that are, for drivers, an everyday risk. The season is a challenging one for Michael and the team, but there are proud moments. In the Winner’s Circle, Michael and the other winners douse the press and the audience with jets of champagne. 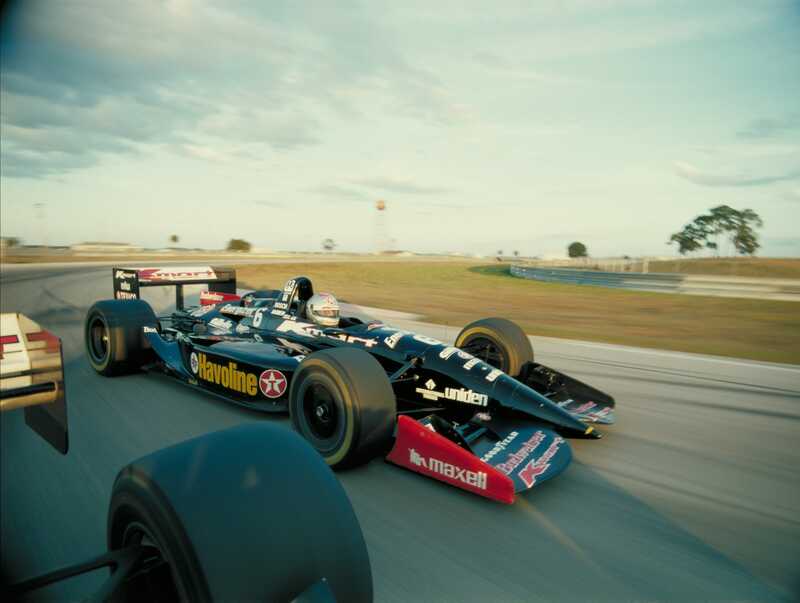 Michael comes in second, after having won five races, more than any other driver, though it is competitor Jimmy Vasser who collects the most points and takes the championship. Don Lyons’ patient restoration work on the 1964 Dean Van Lines Special is triumphantly completed and the white and chrome roadster is rolled ceremoniously out of the workshop and its identity is revealed — it is the very same machine that once initiated Mario Andretti, as a rookie, into the high-profile world of Indy car racing. In the concluding moments of Super Speedway Mario is reunited with the great old machine. “My whole career really began with this roadster,” he notes, as a black and white film clip from 1964 shows a smiling young Mario strapping himself into the car for a test drive on a deserted speedway. In the present, Mario straps himself into the roadster once again as the car’s proud restorer stands by. “The car and I were really made for each other,” pronounces Mario. “I just put my foot to the floor and, as they say, the rest is history.” The engine roars to life and Mario takes the resurrected machine for a drive — hurtling nostalgically through the fall colours of the Michigan countryside. 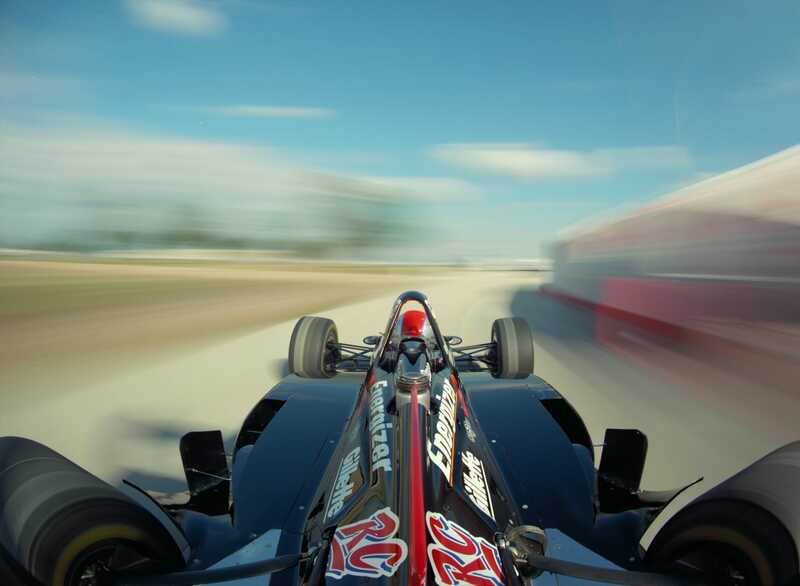 At top speeds in excess of 230 miles per hour, an Indy car is traveling more than a football field every second. 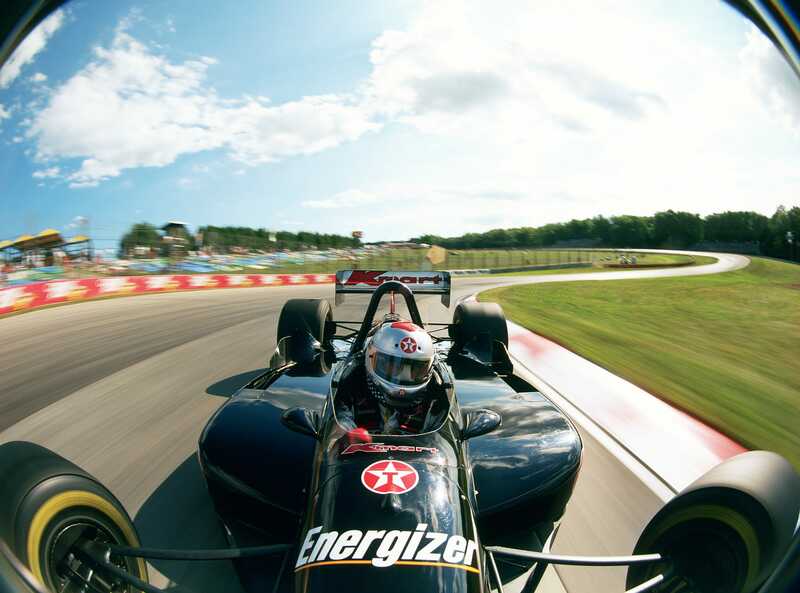 An Indy car weighs only 1,550 pounds, 220 pounds less than the diminutive Suzuki Swift! An Indy car rolling chassis (the car without its engine, turbocharger, electronics or tires) costs approximately $420,000 U.S.
Indy cars have a maximum length of 16 feet 3 inches (4.95 metres), a maximum width of 6 feet 6 inches (1.99 metres) and a maximum height of 2 feet 8 inches (.81 metres). Sweating can cause a driver to lose up to 10 pounds (4.5 kilos) during a two-hour race. 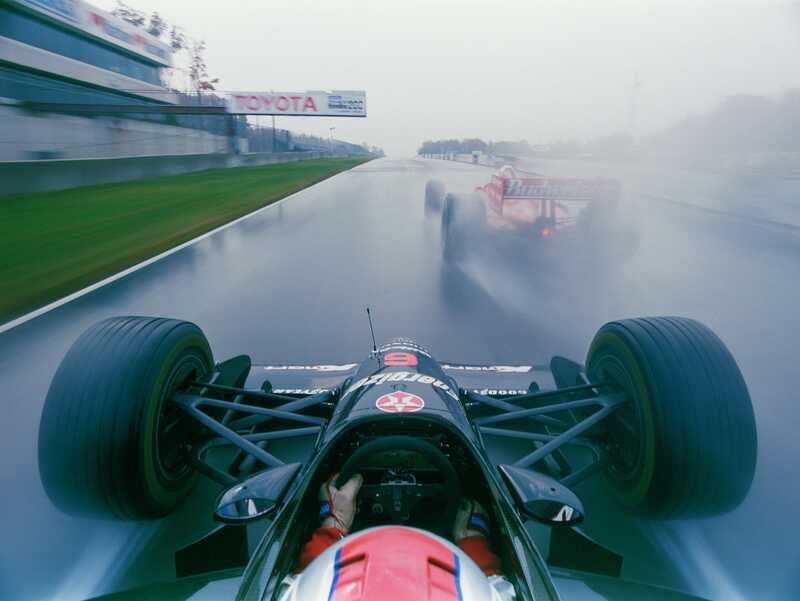 At speed, Indy cars produce so much downforce they could drive upside down on an inverted track! 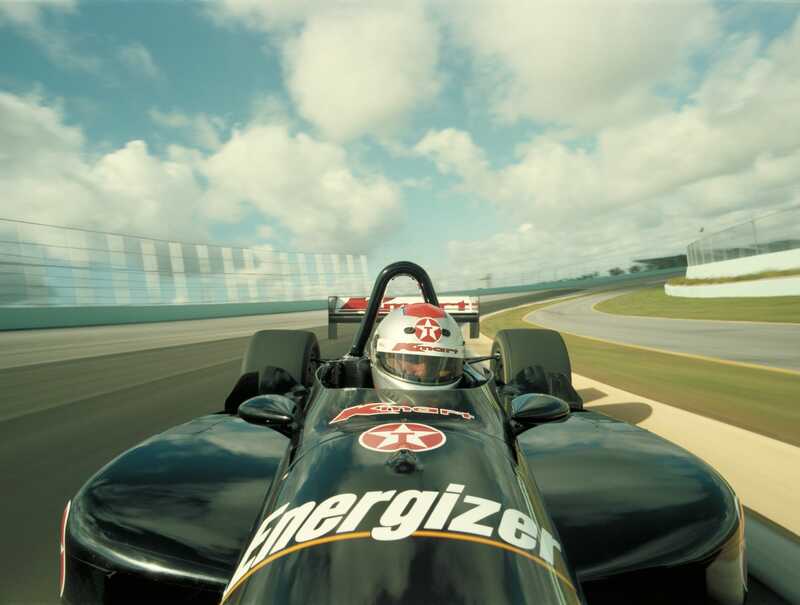 Indy cars can generate four Gs (four times the Earth’s gravity) of lateral acceleration driving around the fastest corners. The side tunnels of Indy cars generate so much suction that manhole covers found on temporary street circuits must be welded down so they are not sucked off when the cars pass over them. 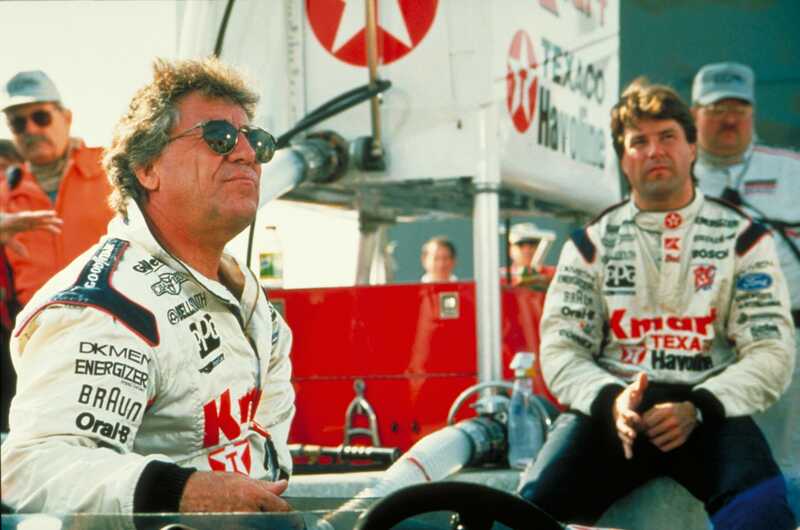 Mario Andretti held the world closed-course speed record; he lapped the Michigan International Speedway at a speed of 234.275 miles per hour (377.042 km/h) on July 31, 1993 (broken by Jimmy Vasser, age 31, in 1996). 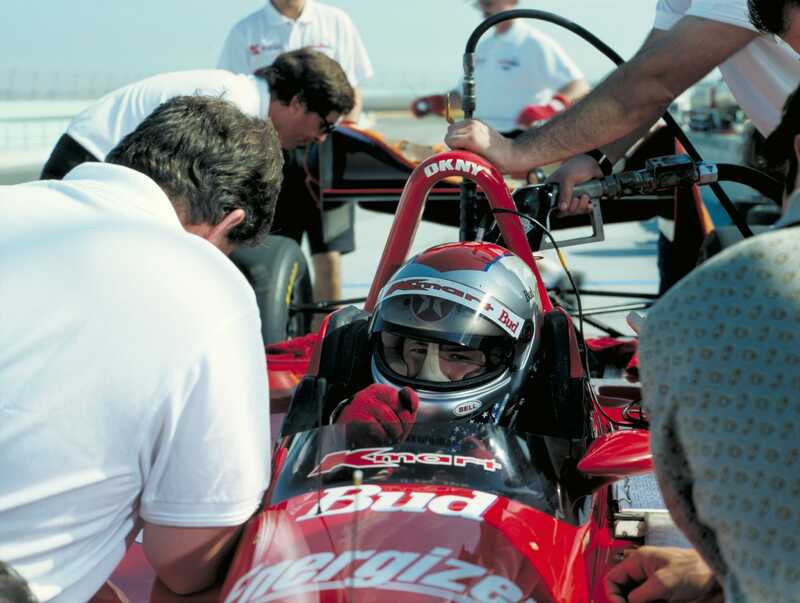 In 1990, Al Unser Jr. drove the fastest 500-mile race ever, averaging a speed of 189.727 miles per hour (305.347 km/h) at Michigan International Speedway. In 1995, Canadian Jacques Villeneuve became the youngest ever CART Champion at the age of 24.